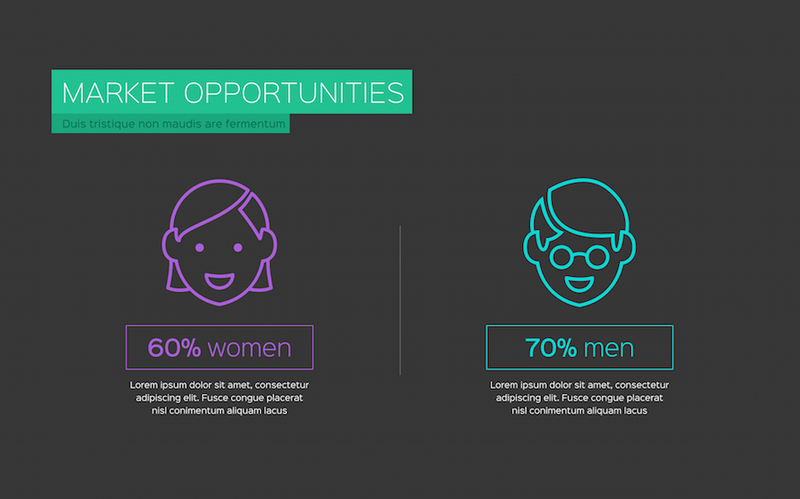 Share your startup’s story with this visually-focused pitch deck template. Perfect for sharing everything from a SWOT analysis to sale forecasts. Explaining all the decisions and research that lead to where your company is today and its future plans can quickly become overwhelming! The Startup Keynote Template methodically presents your information in an easy-to-understand format. With 28 customizable slides in 3 unique color schemes, the Startup Keynote Template provides founders with a set of slides perfectly geared for sharing their business with others. Sleek slides deliver beautiful charts, graphs, and infographics to display data in a visually compelling manner. Easily change the color and size of the 22 vector icons included to complement your content. 28 unique presentation slides designed by professionals that you can easily edit and fill out with your personal content. 22 icons are used in this template which you can flawlessly move, resize or change colors throughout your presentation slides. 3 color flavours are available in this template. You can easily choose the color scheme that fits your needs. What's included in Startup Keynote Template?